May we introduce ourselves? Our family business has traded as a Pork Butchers in Sheffield for over 50 years. We pride ourselves on providing high quality traditional Pork Pies, Cooked Meats, and Sausages made with produce sourced where ever possible from local Sheffield farmers & suppliers. Our aim is to provide a quality service to all our customers new and old. Our reputation is built on our commitment to providing only the best quality products, backed up by customer service levels that we strive to make second to none. Just a word or two about our Pork Pies, made to an old closely guarded recipe, they come in a variety of sizes and are baked fresh every day. Over 200,000 are sold every year! We also have a range of impressive celebration and speciality pies. Our meat goes directly from the farm to family owned slaughterhouses to us with no middle man. We pride ourselves on not just having the highest quality local meat available but also on delivering the highest level of customer service to our favourite people in the whole world: you, our customers. If your looking for the best wholesale pork butcher in the UK. Look no further! And don't forget about our Pork! We have an extensive range of fresh pork, including our famous loin and leg joints, shoulder and succulent belly pork. We believe our products speak for themselves. Browse our current product list below. 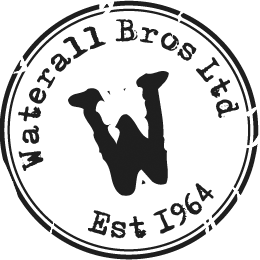 We'd like to keep you up to speed with the latest goings on at Waterall Bros so please follow us and stay abreast of all the news. To contact us please use the details below or fill in the form and we'll get straight back to you.